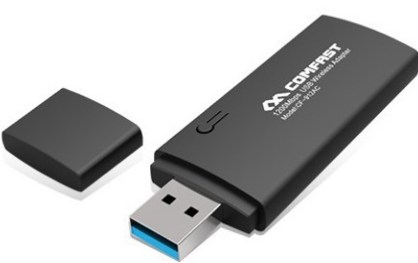 Comfast CF-912AC Driver Download - Comfast CF-912AC is a Wireless USB Adapter that supports 802.11ac connection with a 2.4GHz or 5.8GHz and also has a very high transfer rate 1200Mbps. Connection to a computer using a USB 3.0 to 10x faster than USB 2.0 LAN adapter. Comfast CF-912AC USB Wireless Adapter is already using USB 3.0 so that the transfer speed reaches 10x faster than the wireless adapter in general are still using USB 2.0. Comfast CF-912AC Adapter can capture 802.11ac WiFi signal with a maximum speed of up to 1200Mbps. 3x faster than 802.11n protocol is only 300Mbps. to form a very small which makes the Comfast CF-912AC USB Wireless Adapter can be taken everywhere. Can use the 2.4GHz and 5GHz frequency so. Comfast CF-912AC Using today's most sophisticated chipset is a Realtek RTL8812AC and 2 pieces RTC5633 power amplifier. Support encryption for the security of your network. Simply press the WPS button on this adapter. Comfast CF-912AC can be used for all operating systems that exist today such as Windows XP, 7, 8 and 10. These adapters consuming very little energy only 5W. we provide download link for Comfast CF-912AC Driver. you can download for Windows, Mac OS X and Linux. Comfast CF-912AC Encryption : 64/128/152 digit WEP encryption,WPA/WPA-PSK,WPA2/WPA2-PSK. Encryption and WPS one key encryption Operation system Windows XP/Vista/WIN 7/WIN 8 etc.